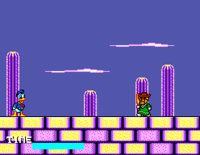 The Lucky Dime Caper Starring Donald Duck, called Donald Duck no Lucky Dime (ドナルドダックのラッキーダイム) in Japan, is a platform game developed for the Sega Master System and Sega Game Gear in 1991. As the name suggests, it stars Donald Duck, who must travel across seven levels save his three nephews Huey, Dewey and Louie from the evil Magica De Spell, as well as the "Lucky Dimes" stolen by her. 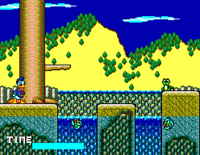 The game was released at the same time as Quackshot, and is often considered to be the Master System alternative of that game as a result. 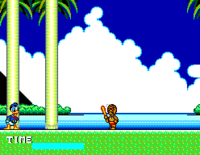 Both have Donald travel to various points on the globe, though The Lucky Dime Caper arms Donald with a hammer (a flying disk can also be acquired during the game) and the ability to jump on enemies' heads rather than relying on plungers. The stories are also very different. A limited edition box set was sold in the UK, which included a music cassette tape featuring songs from various Disney films, a Donald Duck t-shirt and a Land of Illusion poster. 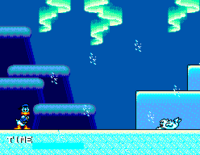 The Game Gear version of the game has different map screen and a more polished introduction sequence, but aside from this (and the smaller resolution) it is essentially the same game. 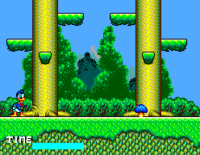 The Lucky Dime Caper was followed by Deep Duck Trouble Starring Donald Duck, which was also released for the Master System and Game Gear. 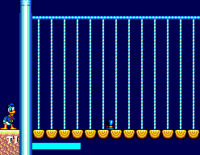 The Lucky Dime Caper is a typical platformer, where and moves your character to the respective direction, is used to get through doors and "ducks". is assigned for jumping, underwater makes you afloat; and attacks. You can throw the Flying Disk up by holding then press . There are seven stages in all, which must be completed within a time limit. Beat a bear boss at the end and save Louie. Rescue Dewey from a cage guarded by a big lion boss. Face two statues possessed by ancient spirits to free Huey. Recover the first Lucky Dime beating a big tropical crow. 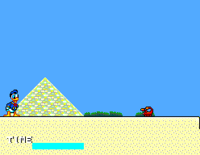 The second Lucky Dime is guarded by a Egyptian crow boss, who is assisted by a giant enchanted snake. Find the third Lucky Dime after beating a big crow that kicks ice cubes at you. The final battle, for the fourth and last Lucky Dime, is against the evil Magica De Spell in her castle, that is full of skeletons and ghosts. They usually hold other items, but there is also an enemy that disguises as them. If you lose the Hammer during the game, or get it replaced by the Flying Disks, you can get it back. They are used as a weapon to attack the enemies from distance. Gives you an extra player. Each star makes you attack faster, both with the Hammer and the Flying Disks. Grabbing a fifth star makes you invincible for a few seconds and reset the stars' count. Adds 500 points to your score. Adds 1000 points to your score. Main article: The Lucky Dime Caper Starring Donald Duck/Magazine articles.